​The company I work for was sending me to Boulder, Colorado for a summit. This is close enough to be a pleasant, one day flight to and a similar, one day flight back. I started planning a month before the actual flight. Planned a few routes, as evidenced in the following images. 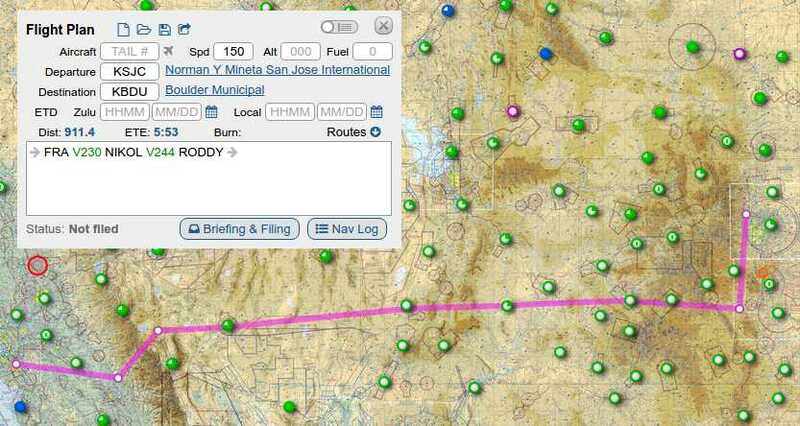 From San Jose to Boulder, low altitude route. Basically following I-80 into Colorado. From San Jose to Boulder, medium altitude (some oxygen requred). Bypassing the highest peaks of Front Range to the south. First route was theoretically the safer one. The highest terrain en route was only 8,700 feet (2,650 m). 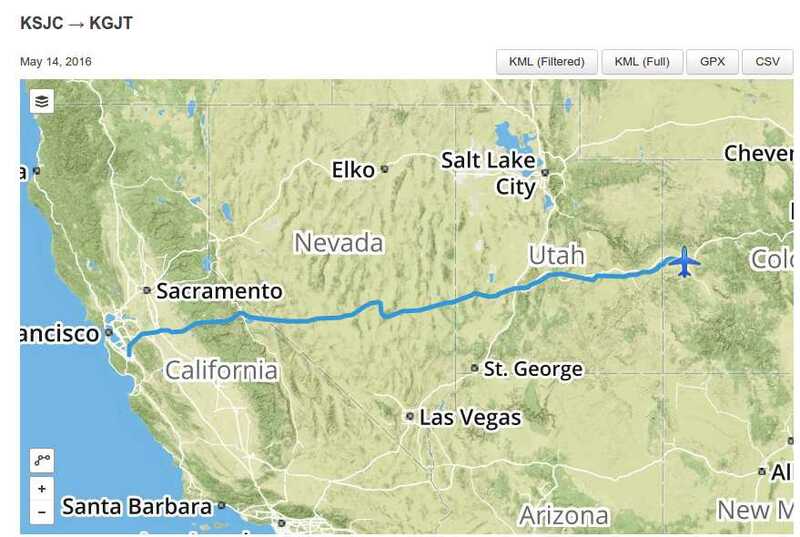 The route joins interstate I-80 and basically follows it throughout California, Nevada, Utah, Wyoming into Colorado. 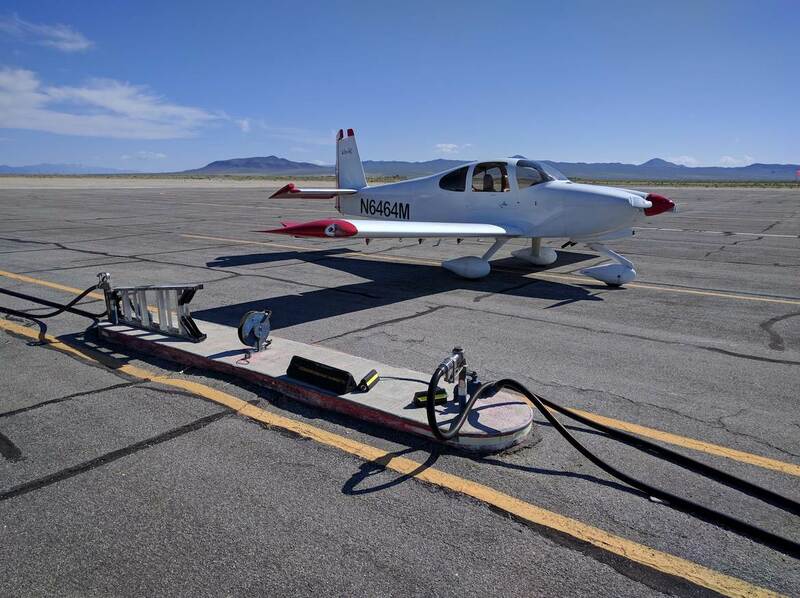 It was going to take about 6 hours to get there, Obviously, a fuel stop would be necessary somewhere.The second route would take me through deserts of Nevada and Utah into Colorado, bypassing the Front Range to the south. It would be slightly shorter and definitely more beautiful. ​I needed to be in Boulder on Tuesday, May 17, in the afternoon. I started looking at the weather about two weeks out. The forecast initially called for some rain showers on Tuesday, but the preceding weekend was meant to be all-clear. This was not to be. As the days, passed, the forecast became worse and worse. Soon, Tuesday was all socked in and rainy, while Monday was to be cloudy. As the departure date drew closer, the weather forecast deteriorated even more. Finally, it seemed that Saturday was the only day to fly before Tuesday afternoon. When you’ve got time to spare, go by air they say, and they are right, no? 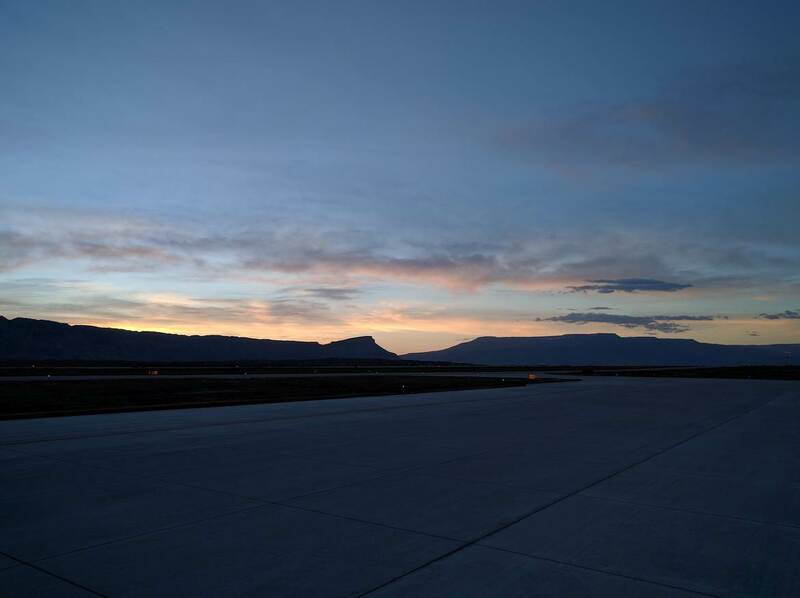 Direct route, with oxygen, and a fuel stop in Grand Junction, Colorado. Finally, decided on a direct route, with supplemental oxygen. I have a portable Aerox system with oxymiser cannulas so getting oxygen up high wasn’t a problem. 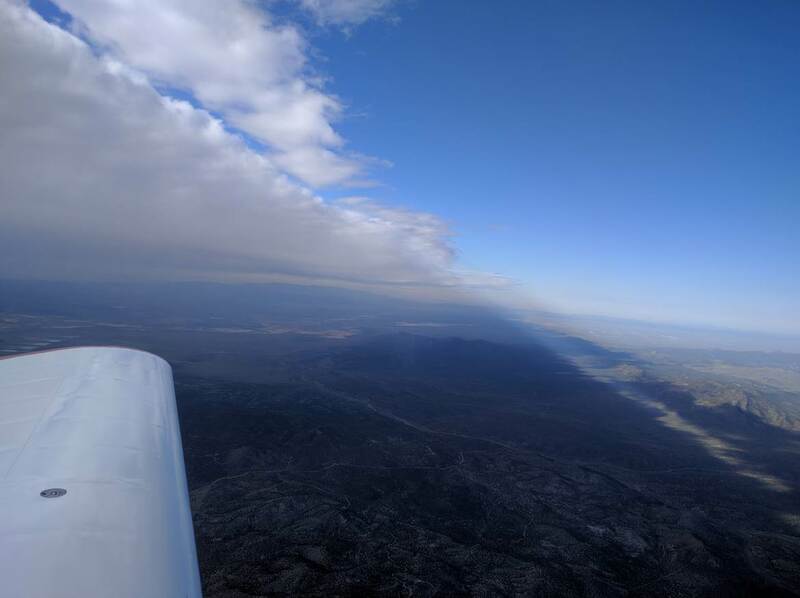 Departed San Jose around 11 AM on Saturday, once the marine layer overcast cleared enough to poke a stick through it. Direct route wasn’t too direct initially, as we still had to deal with the dissipating marine layer, so we followed Sunol pass, Livermore Valley and Altamont pass quite low below the clouds. The overcast cleared as we entered Central Valley and we started our climb to 13,500 ft (4,100 m). 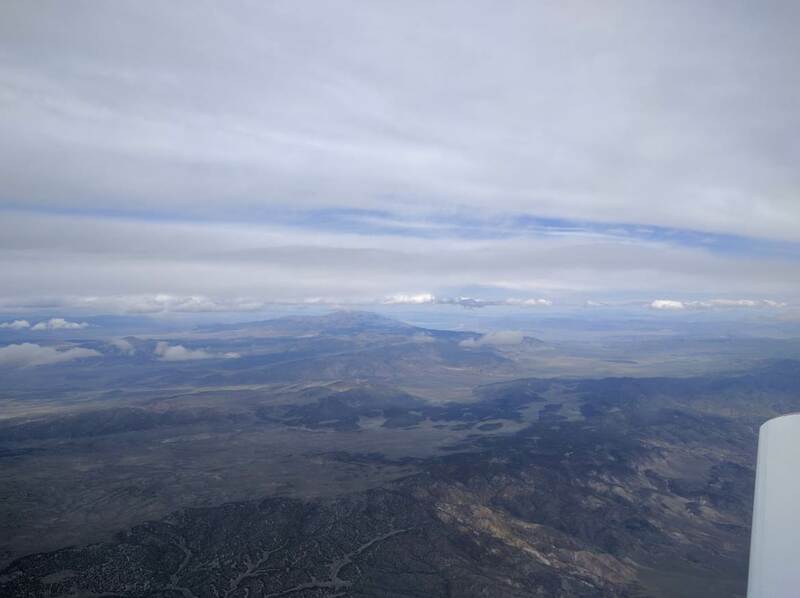 Crossed the Sierra Nevada range in vicinity of Yosemite, over Mono Lake into Nevada. Flight following dropped us over the Sierras as we were too low for their radar coverage to work. We reacquired flight following with Oakland Radio about 20 minutes later on the other side of the mountain range. The air became turbulent, so I throttled back to 125 knots indicated, that still amounted to 145 knots true and 165 knots ground speed. We were getting amazing 8.5 gallons per hour when throttled way back and lean of peak. Gotta love that. In the middle of Nevada we spotted a huge dust devil, a tornado almost, about a 1 km tall. Funnel dust cloud was quite well defined. You can see on the track above that we have given it quite a wide berth. Going into eastern Utah, we got some lightning and thunder from nearby clouds so we meandered around to avoid obvious buildups. That worked well, and we finally landed in Grand Junction around 5 PM Mountain time. We took fuel, only 39.6 gallons after 4.7 hours of hobbs time. Can’t stop admiring the efficiency of the airplane. ​We took fuel and by the time we paid, the storms have closed all around us. Since small airplanes and thunderstorms do not mix well, we decided to spend a night in Grand Junction. Next day, in the morning, we woke up to another thunderstorm right at the airport. The storm has cleared but there was an intense band of precipitation north of the field so we were reluctant to go through it. The forecast was getting even worse from there, so it was time to implement Plan B. We rented a car and drove to Boulder from Grand Junction. The weather on the way was quite pleasant, so maybe we overestimated the severity of the weather. But, it is better to be down here wishing you were up there rather than being up there wishing you were down here. Isn’t it? ​My summit was over by Thursday evening. I checked the weather (which was supposed to be sunny and warm Friday) and to my horror, realized that yes, it will be sunny but the winds will be terrible. The forecast called for 30 knots gusting to 45 in the afternoon. In the morning was more manageable 12G20 and right down the runway. I skipped the summit dinner and drove to Grand Junction on Thursday evening. Came up to the airport 5:30 AM Friday to observed winds of 28 knots gusting to 35 but blowing right down the runway. While maybe I could manage taxi and takeoff in such winds, there was no airport in Utah or Nevada with winds forecast to be less than 30 knots. A big low was moving northwards through Nevada and Utah. 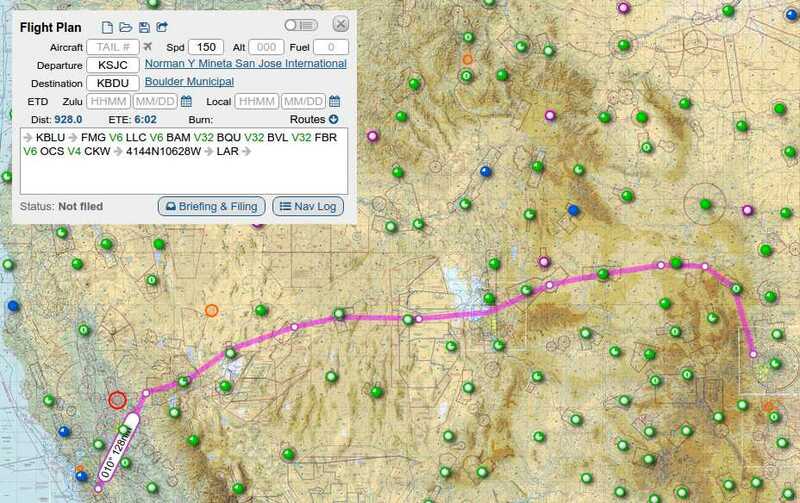 I checked every airport, even Las Vegas and Salt Lake City and even looked further south, to Yuma, Arizona. Everywhere the wind situation looked bad. I decided to spend a nice day in Grand Junction. Found a cafe (not Starbucks) and worked from there for the day. ​I came to the airport at 5:30 AM again. This time the wind was much more manageable 12 knots gusting to 18, right down the runway. 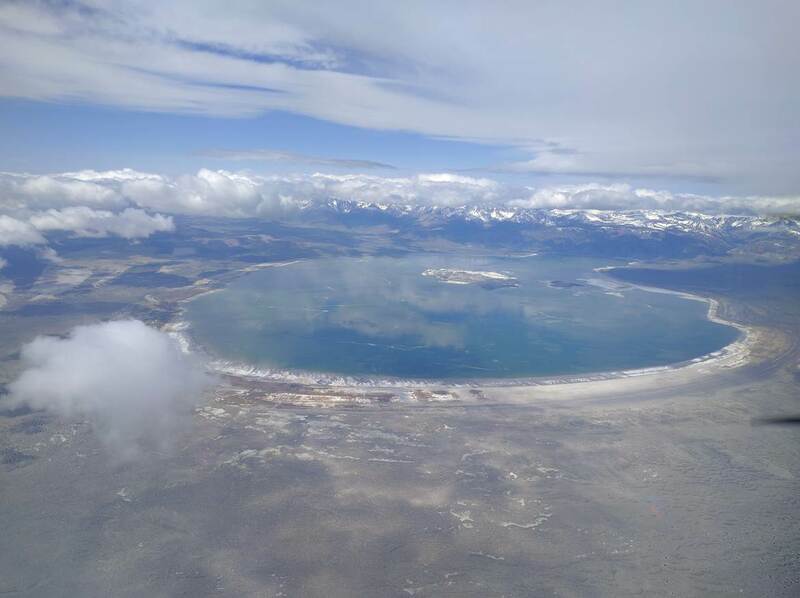 The northern Nevada and northern Utah airports were reporting low ceilings and precipitation so I abandoned the idea of overflying Great Salt Lake and following I-80 back home. 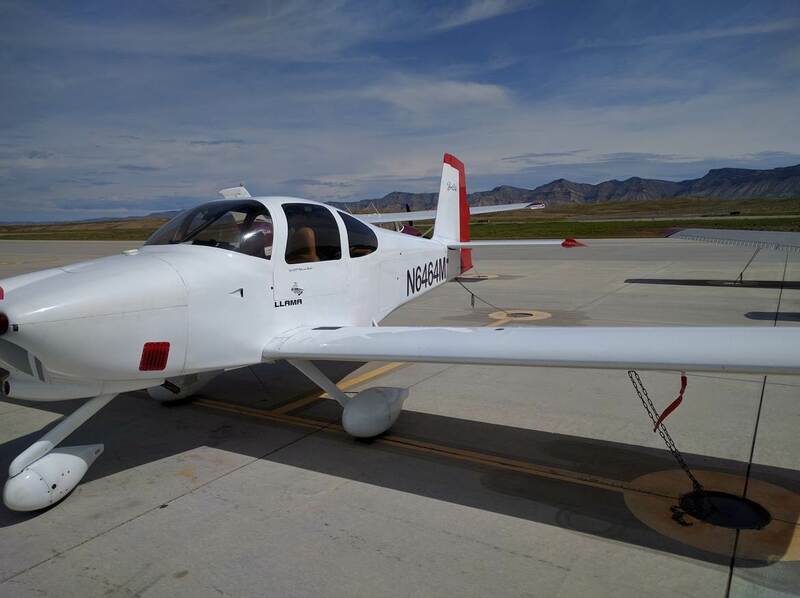 I flew pretty much the same way I came into Grand Junction, which took me through central Utah and central Nevada to my fuel stop in Tonopah. The visibility wasn’t great (see the gallery) but manageable. It was getting worse though and that worried me, so I was ready to divert or turn back if necessary. 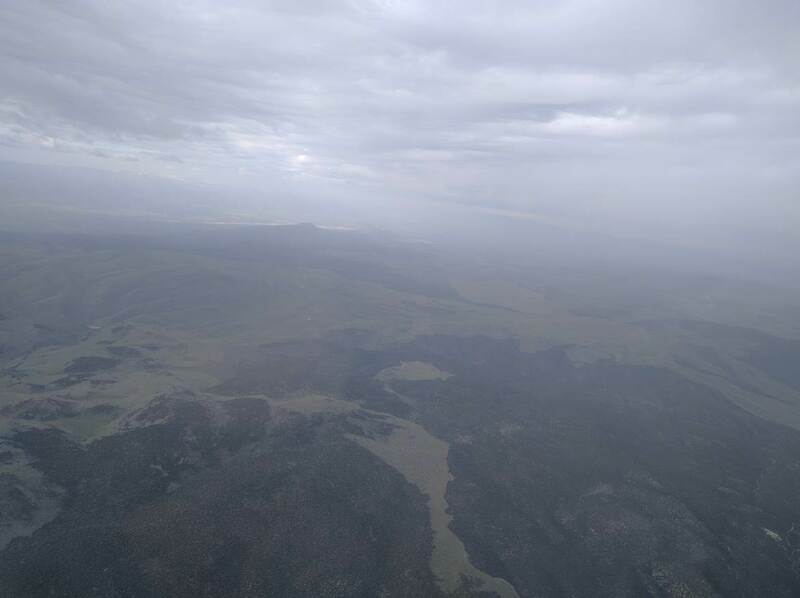 Somewhere in central Utah, I saw what I thought was a horizon underneath the cloud about a 300 m (1,000 ft) above me. Turned out I was wrong as I entered solid IMC. I executed a standard rate, 180 degrees turn back and immediately exited the IMC. I am thinking that the horizon I saw must have been a shadow of another cloud, just shaped as a horizon line. I diverted quite far to the south to find a manageable passage through the front. KGJT to KTPH (fuel stop). 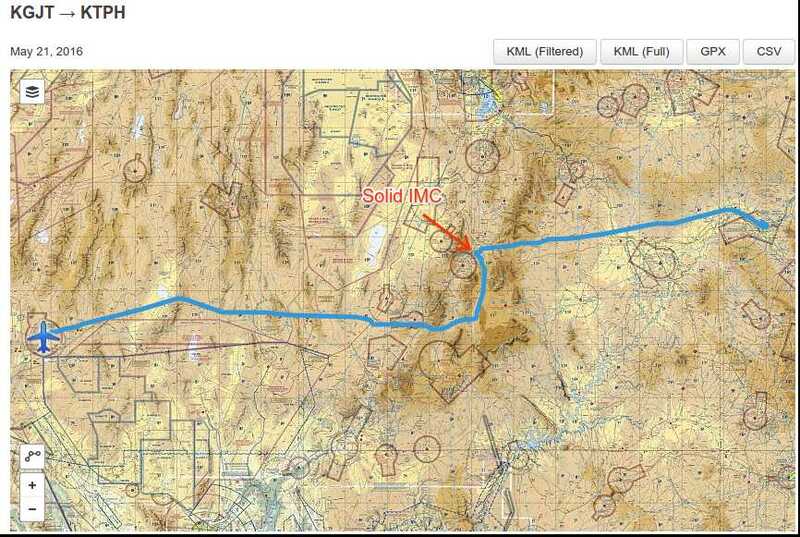 You can see the 180 degree standard rate turn where I entered a solid IMC. When I entered Nevada, I was greeted with an immediate improvement in visibility and sky became clear. Look into the gallery for a picture of a razor sharp cloud front and poor visibility behind it. I was glad I was exiting these conditions. Found the airport and landed in Tonopah uneventfully. While taking fuel, the lady running the pump mentioned they had a dust storm previous day with winds blowing upwards of 50 miles per hour (80 km/h). I am very glad I spent that Friday in Grand Junction. 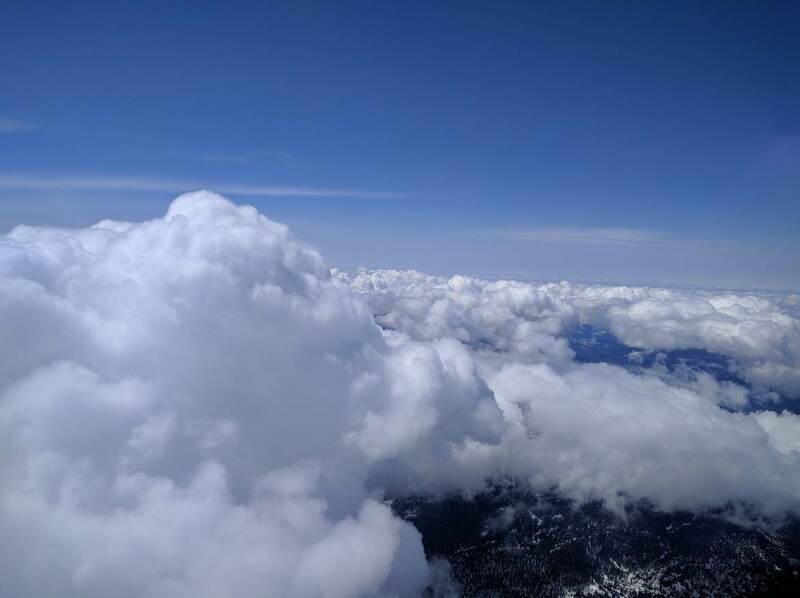 Over the Sierras I went, climbed to 16,500 to avoid cumulus turbulence. It was very smooth at that altitude, and oxygen system/cannulas worked well to keep me alive. 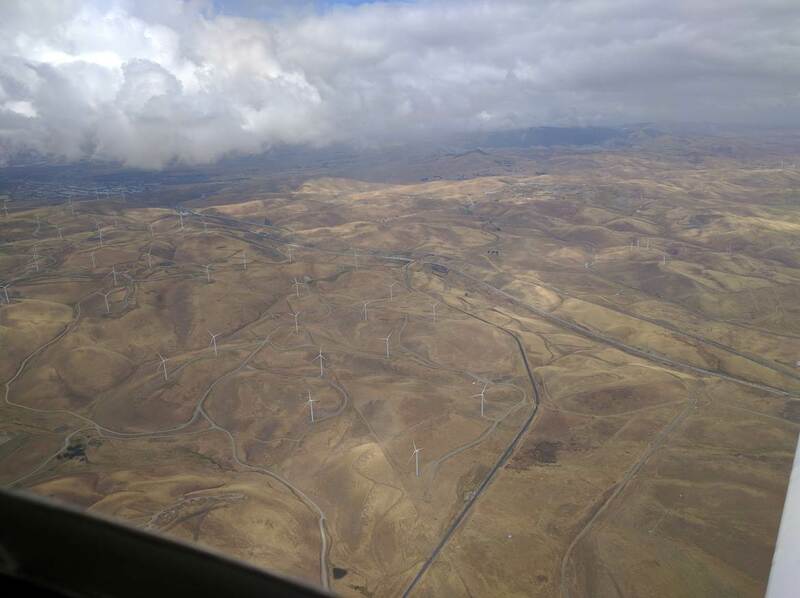 Coming down to Central Valley I saw scattered cumulus but closer to the coast the ceiling was broken. 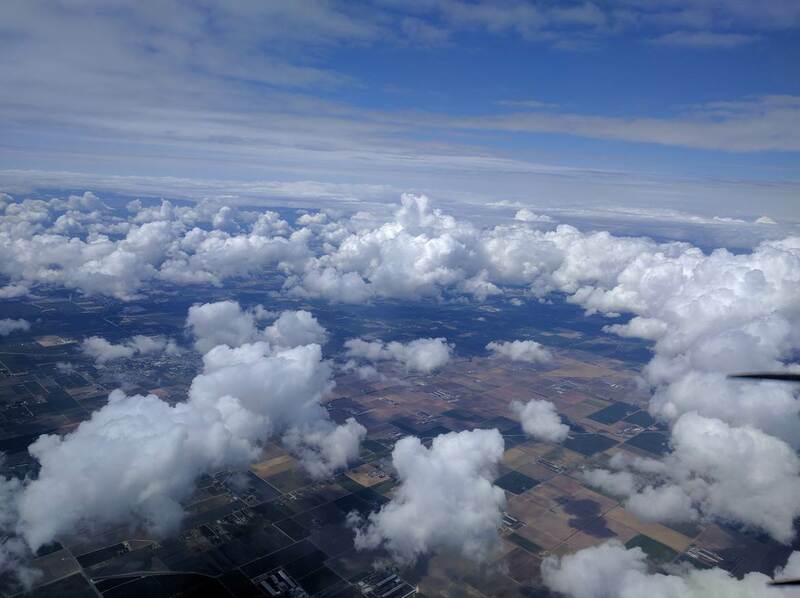 I ducked under the clouds (the ceilings were about 3,500 so not too bad) and landed uneventfully at San Jose at around 12:15 PM Pacific. The total hobbs time for this return trip amounted to 6.0 hours. Awesome. 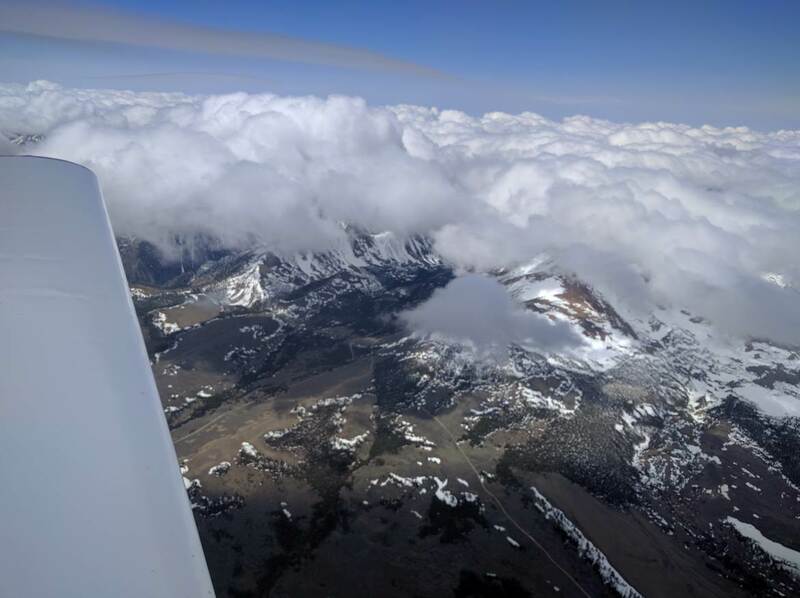 Over the Sierras near Mono Lake at 16,500. At least now I know how high the plane will go without too much trouble. And now have a look at the pictures!